As much as I enjoy my days travelling on my bicycle, I equally look forward to the times I don’t. I had a special reason today. At 60, there is only so many mountains you can climb and I was all but satisfied with the number we’d visited since arriving from Slovenia almost two weeks earlier. Having climbed five of Italy’s best – Stelvio, Gavia, Mortirolo, Tre Cime di Lavaredo and Zoncolan – I was more than two-thirds of the way into the list of 50 of the world’s greatest road climbs found in my mate Trev’s cycling magazine. With another 11 still to climb, and with a variety of continents including North and South America, Europe and Asia left to visit I won’t lose too much sleep if I don’t reach the summit of all 50. Besides, I was a little sceptical in the first place about some of the climbs the magazine included, especially those in Belgium. No more than a kilometre or two at best, they were a bit poncy. Nevertheless, the magazine article opened up doors; well travelled I have my own preferences, and they are now a part of the long-lasting memories I'll savour. Call it a mid-life crisis, but I first got the idea of cycling around France about 18 months before my 55th birthday. I guess Trev sowed the seeds by lending me a cycling magazine with 50 of the world’s greatest road climbs in it. Most of them were in Europe, with a heavy emphasis on the famous mountain climbs in Italy and France, plus other climbs in Austria, Spain and America. Even good old Down Under scored a mention with Mount Baw Baw, another relatively short climb east of Melbourne. Though only 6.5 kilometres in length, it’s not surprising it was included, as its steepest gradient is above 21%, with a staggering average of almost 13%. Pretty impressive; certainly more challenging than the four ultra-short climbs in Belgium included on the list. To put it simply, each of them was but one- third the length of my “pimple”, Arthurs Seat. Whatever the merits of the magazine article, it had some magnificent climbs in it that I wanted to experience for myself. I’d climbed all of Victoria’s highest road mountains on a number of occasions, including Baw Baw (five times), and Arthurs Seat thousands of times. How great it would be to compare them with some of Europe’s most legendary mountains. ......Extract from Lycra, Lattes and the Long Way Round. 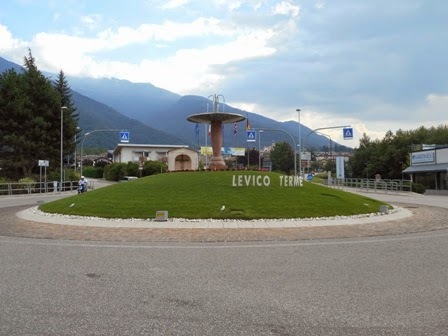 Roz and I were looking forward to my bike-free day in Levico Terme, a thriving spa town surrounded by beautiful mountains and lakes. Situated 20 ‘somewhat difficult’ kilometres from Trento, the capital city of the region, it has a population of not much more than 7,000. Just perfect if you’re a tourist wanting to escape the frenetic pace of city life, while at the same time catching a glimpse of new people and their distinctive culture. We spent part of the afternoon strolling up and down the town’s main street, which is accompanied by a metre-wide artificial channel of running water. Soon becoming more interested in something a little deeper we could swim in, we headed down towards the town’s lake; aptly named ‘Lake Levico’. A stunning blue colour and nestled in a mountain backdrop, it almost resembled a Norwegian fjord. The only things missing were the narrow streams spouting water below. 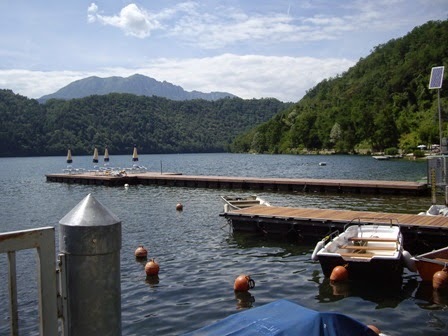 The second largest lake in the Sugana Valley, it’s a popular tourist destination, as testified by the hundreds of people we saw swimming, sunbaking, sailing, walking, fishing, and even riding bikes along its kilometres of treescaped waterfront. Local dancers performing the Viennese Waltz. Later that evening we were treated to some local festivities in the town square. 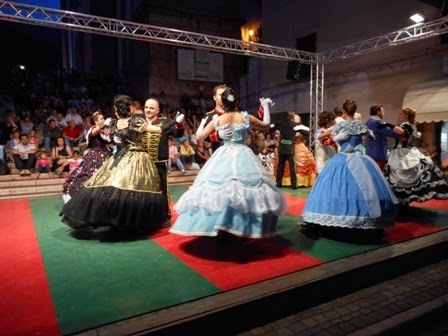 Obviously attributed to the period of the Habsburg rule, 20 or more performers dressed in 18th century costumes danced to the music of some of the great Austrian composers. Performing different versions of the Viennese Waltz, they travelled around the small outdoor stage like skaters on ice. Perpetually smiling, apart from one or two of the young male dancers who looked a little nervous, they provided us with an enjoyable insight into the prevailing culture and tradition of thousands of European towns and villages, just like Levico Terme. ﻿﻿Like so many places we’d visited, we could have stayed much longer. That’s not to say our next destination, the equally small town of Ala, nestled in the beautiful Lagarina Valley, wasn’t equally as good. Like Levico Terme, two days earlier, just getting there was the problem.